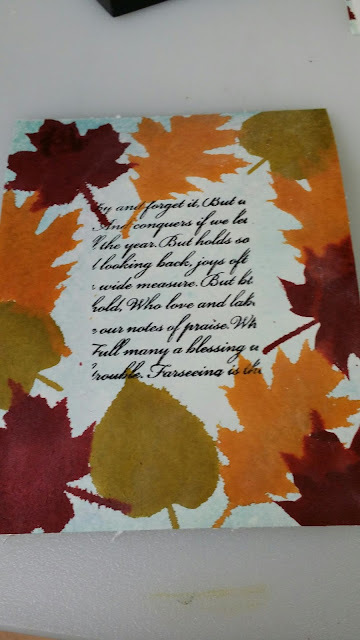 Starting to get in the fall mood so I thought I would make a card that had floating in my head. To start off I took a piece of watercolor paper and taped it down using some painters tape that I previously used when spraying dylusions ink. This tape had residue left on it from the teal and magenta ink. When I misted the paper with water a very faint blue seeped on to the paper and I rubbed it in. 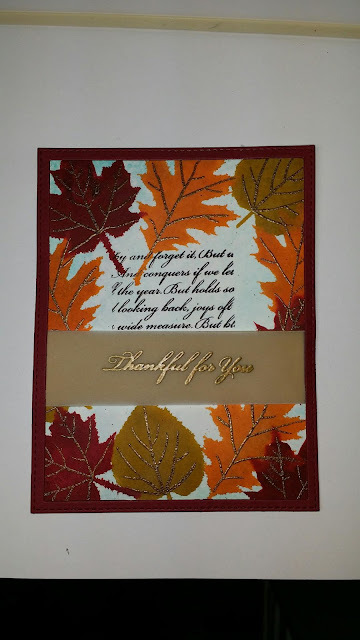 Using MFT'S Thankful Leaves stamp set and MFT's dye ink colors Cranberry Cocktail, Fuse Green, and Orange Fizz I stamped the leaves leave the middle open to stamp the word stamp in black. The veins for the leaves were stamped in versa mark and embossed with gold embossing powder. Thankful for you sentiment was also stamped in versa mark and golf embossed on a strip of vellum. I used blueprints 24 and 25 and cut a cranberry cocktail cardstock frame. At first I didn't have anything behind the vellum but decided to put a piece of fuse green cardstock behind it. To assemble the card I glued the piece of fuse green to the base then added the vellum piece wrapping the edges around the base to attatchment it. To finish it I glued the cranberry cocktail frame to the base. Thanks for stopping in. I hope you enjoyed the card.